Christmas at Tiffany’s is a novel about friendship and love throughout a journey of discovery and reinvention. Having gone through a similar starting over process myself as the main character, Cassie - unfortunately without the world travel - I could relate to much of what she was going through. There were times though that I wondered what she was doing or cringed at her decisions and those her friends forced on her, but in the end Cassie found her way and I enjoyed watching her do so. I swooned when this gorgeous book arrived in my mailbox, expecting a story about Christmas in New York City, which I’m a complete sucker for even though I have never been myself. I had looked forward to living vicariously for a while, but I felt a little let down by this cover and title as this novel rushes through Christmas during its journey through three seasons. The title does come into play though, so I wasn’t altogether disappointed, but I had hoped for more of this magical season in the bustling city. Cassie doesn’t spend too much time depressed and moping about which I appreciated and I did giggle out loud at times through this novel, but at times I wondered how these very different women were friends. When Cassie was visiting each of them on their own turf (New York, Paris and London), I frequently thought they took it a little too far in their influence and transformation of her. It was like they didn’t even know her. I wanted them to leave her alone and let her figure it out on her own and I think it especially irked me that it was mostly outward focused, not inward. In the end, they did come around and recognized Cassie was her own woman and stopped trying to transform her into something she wasn’t. The love story in Christmas at Tiffany’s was interesting, definitely different, but somewhat aggravating and predictable. It took eons of bumbling miscommunication for them to figure out that it became a bit irritating, even though some of the scenes were enjoyable along the way. There were some surprises outside the love story which dampened the overall predictability of the book. In a side note, I hated the format of this novel. It was one of those huge paperbacks that are ridiculously awkward to hold and actually gave my hands cramps. It was worse than a hard cover. I would have preferred smaller print or an actual hardcover for this one and the only reason I mention it is that it really did take away from my enjoyment at times because I had to put it down. 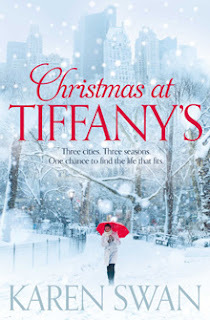 In the end, I did have a smile on my face as everything wrapped up in a neat little blue bow and as Kaley said in her first review for us, if you like your chick lit endings all wrapped up in a happy little bow, you’ll love this one.